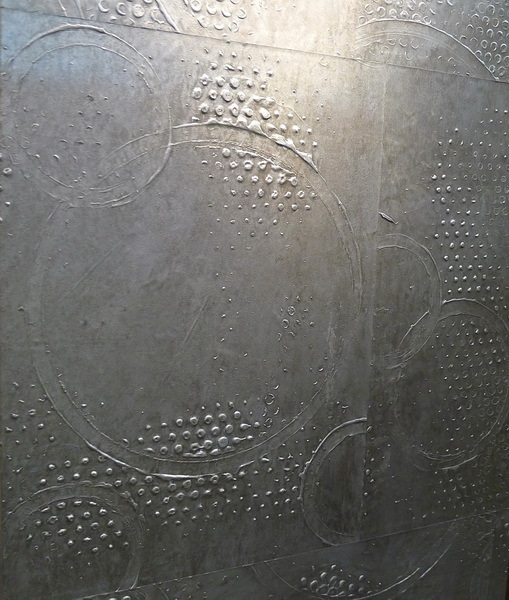 A couple of months ago I traveled to the Coverings show to see 2013 tile trends first hand. Coverings is an American showcase for all things tile. 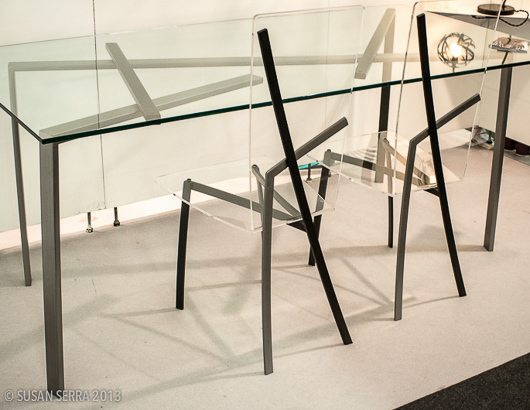 The design fair was held in Atlanta. I attended at the invitation of the Coverings show officials, a great opportunity. While I have many, many images of tile from the trade show, some of which I will feature in the near future, I'd like to start my coverage (overdue!) with a few of the tile companies who are members of the Tile of Spain trade association. 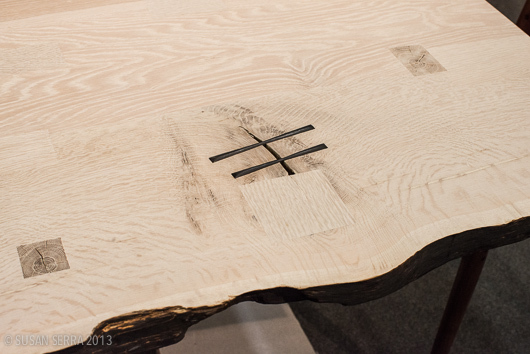 Here is a slideshow which features my images from the show floor! 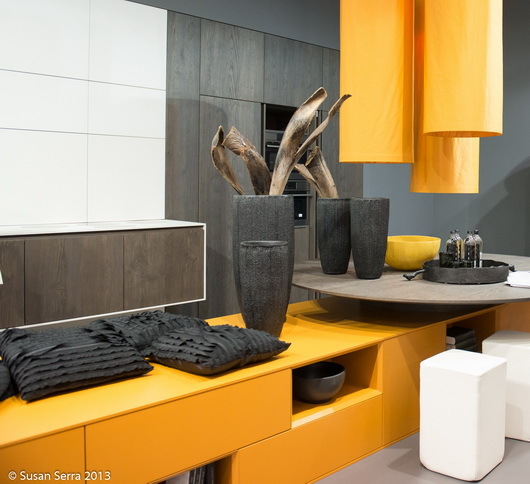 Following are trends that I have identified at the show that are true for Tile of Spain as well as trends which were seen throughout the show. Warm tones - cream, beige, camel, brown and red are rising. Emerald and blue are important in North America this year. In addition to these trends, the refreshed traditional tiles such as Spanish and Moroccan looks continue their innovations, producing exciting new designs. I have many more images which I will share with you in the days ahead! The kitchen and bath industry show, known as KBIS, just ended in beautiful New Orleans. I take this annual pilgrimage each year (maybe this was my 22nd or 23rd annual show) to see new products, learn new things, see friends and otherwise, just immerse myself in the world of kitchens for 4 days. 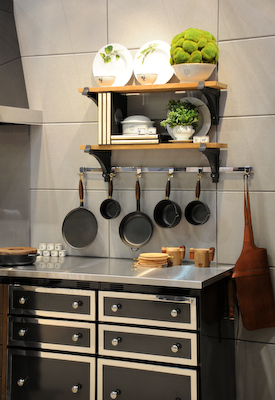 While the kitchen show has decreased in size, there are always fantastic products to discover as well as trend dots to connect. 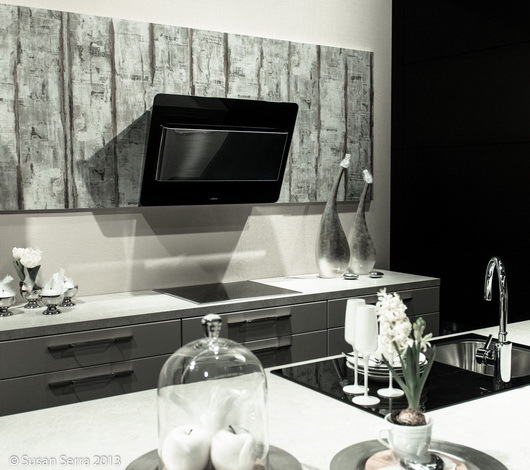 After all, kitchen design IS fashion for the home! It's not work for me, it's all about discovery. I sat down after the show, this week, and went through my images (over 500) and put together a comprehensive slideshow on what I believe to be the coming trends this year and beyond. 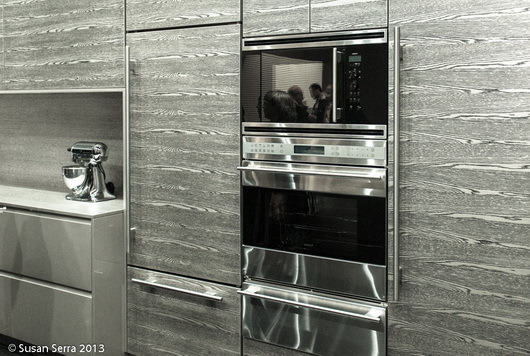 You can flip through the slideshow below, but to see it full screen, follow this link on KBIS 2013 Top Kitchen Trends. I have a list of trends I spotted in slide #11, but the big takeaway for me was this: We are moving toward "The Practical Kitchen". Practical is good - it's efficient, it's easy access, it's simple, it makes sense. So many products were designed around a practical point of view. This also means easy to use and easy to clean. Of course, this design concept can be said to be closely connected to Universal Design, and in fact, it is, but for those who may not be familiar with that term, they will surely see a pleasant and sort of, people/ergonomic-centric focus in new products from many brands, large and small. Consumers may not even realize some of the products were made to make life easier, as so many products were also so good looking, and that's just fine. When you consider that knobs are back (what could be easier than turning a knob), matte finishes are emerging, storage aids inside cabinetry are being designed to enable even easier access than ever before, with lighting in the kitchen designed to illuminate anything at all that needs to be lit, I can report that life in the kitchen just got BETTER. 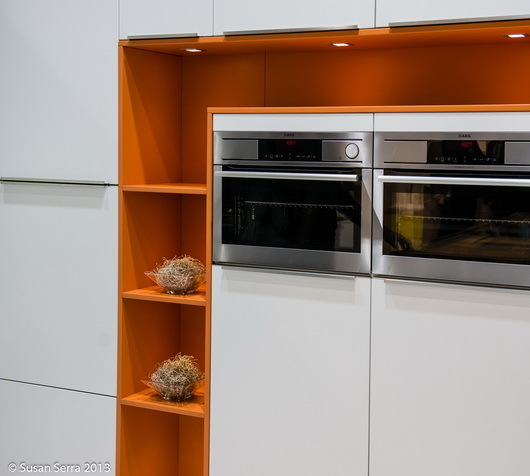 There were some stand out products for me, which I will put together in a post in the near future, but trust me, this slideshow gives you as comprehensive a look at KBIS as I think you can find! Here's an image I took while in New Orleans, and I'll have to do a post with some of my images. Talk about design inspiration? Just take a walk in New Orleans! Cool, right? They definitely are two hip trends, often mixed up with other kitchen design trends that I listed in my first post on this show. 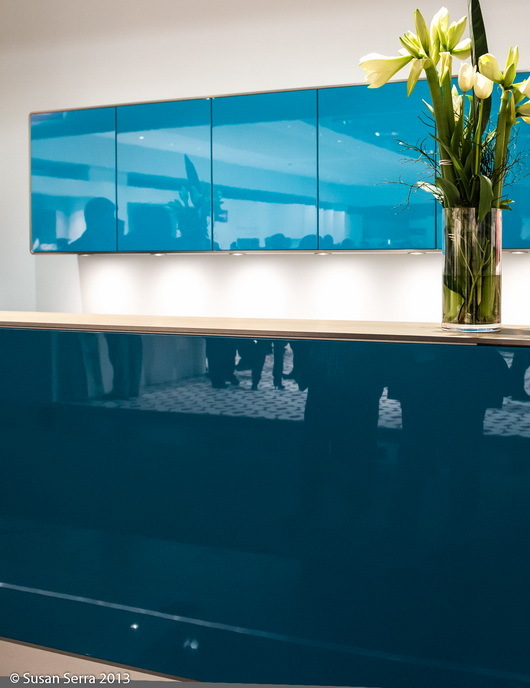 There is no doubt that nearly every European cabinet manufacturer puts their most creative foot forward in an effort to present eye-catching displays - and it certainly works, like a magnet to design lovers! 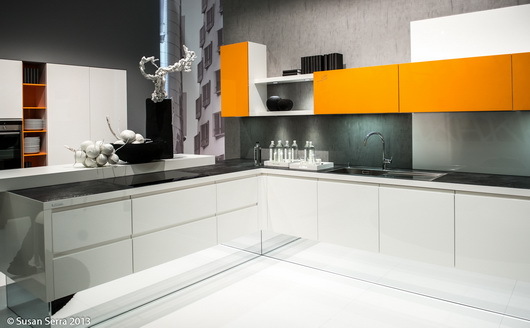 Well designed, tasteful, cabinet designs are very enjoyable to see, and to learn from too - always, to learn from. Part of the learning process is to look for design attributes which "speak" to you, adding to your global (as in overall) view of design. At some point soon, I will share what I discovered that spoke to me personally. 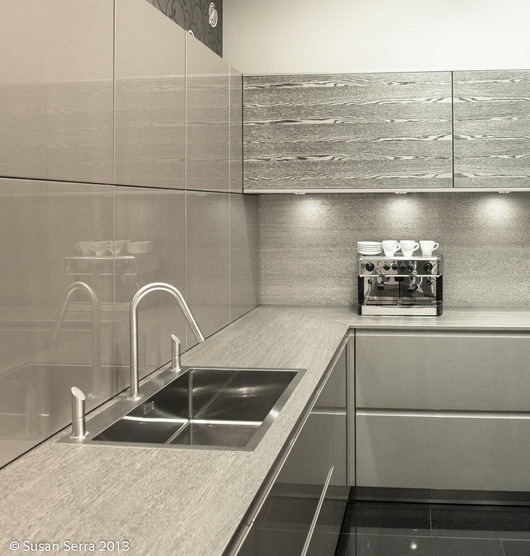 To my eye, these kitchens are uncluttered, which gives an opportunity for a design to be fully appreciated. While I would not say these trends were mainstream, they were quite prominant. 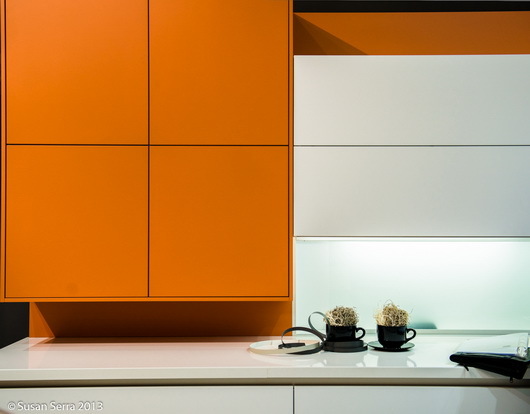 Of course, committing to color could be risky, depending how it's designed into the kitchen. 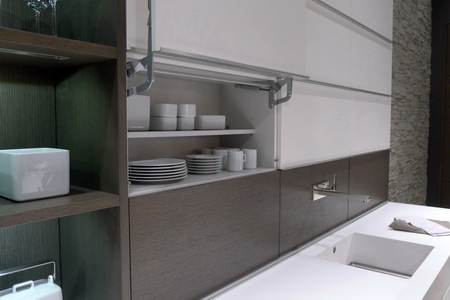 If designed into the kitchen in a way that could be temporary, which is possible, it could be an easy "out" to replace one section of cabinetry, should you get tired of it. In that scenario, put that chartreuse section of cabinetry in the garage, basement, or other area to add to household storage needs. Some design decisions are the type where, once you are on the "other side" of the decision, which happens during installation, you don't always know exactly how you will feel. That's surely where a design professional can reduce the anxiety by providing expertise and drawings to work it through as completely as possible. I definitely think many of these designs are innovative, bold, and worthy of study. SO! 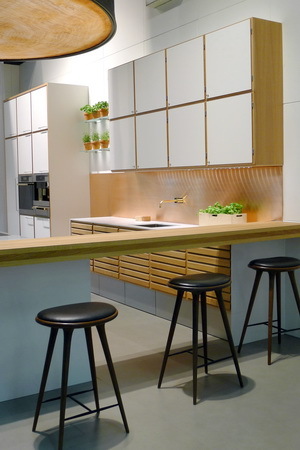 Now the fun part starts as I begin a series of follow-up posts to my initial breakdown of kitchen design trends I spotted while at IMM Cologne LivingKitchen a couple of weeks back. 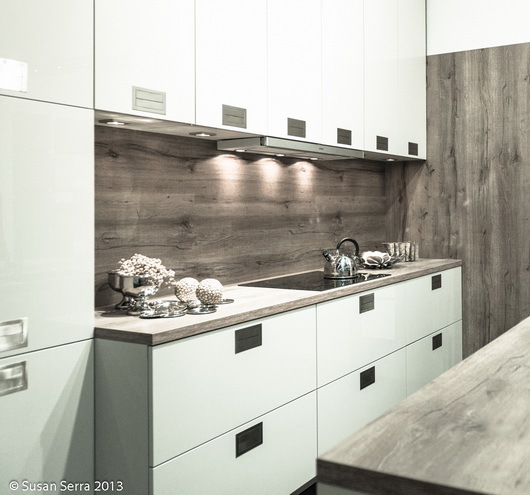 The first category to focus on is cabinetry style. Without further ado, the gorgeous images! Below: Without equivocation, neutrals remain the stronghold of today's cabinet finishes. White painted or laminate cabinetry, light woods (more than I've previously seen in the past several years) and greige dominate. 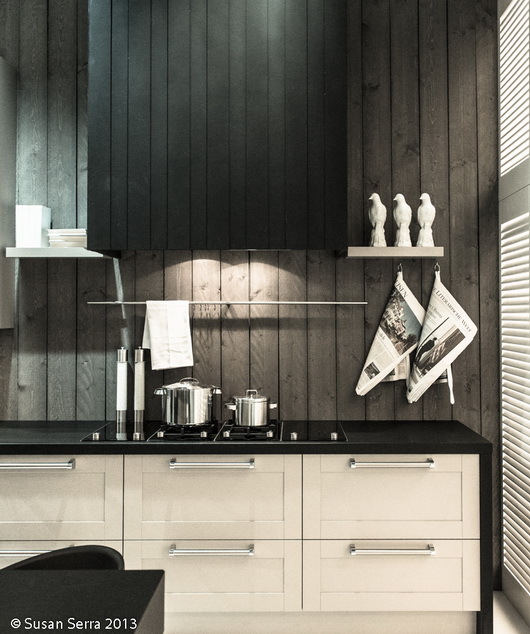 Black cabinetry is well on the periphery, as are dark wood finishes. What do you think of these styles? Due to this image-heavy post on just the first kitchen design trend noted, I'll leave it here for now and will be covering all of the trends noted as quickly as possible! The 9-day London Design Festival and all its 300 events throughout the city commences today! In a few days, I will be on a plane to London with 18 other U.S. design bloggers to do nothing but observe, learn, interact with, breathe, and talk design. I am honored to be a part of this impressive initiative to bring US design bloggers to London. The concept to sort of comingle bloggers from the US and from the UK was that of Veronika Miller, founder of the design-rich website, Modenus. In a moment, we will hear Veronika's own words, as she describes the creative thinking behind BlogTour2011. 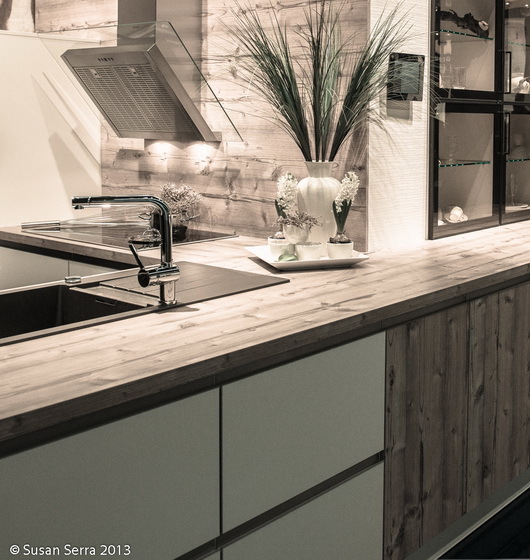 As a kitchen design professional, I am especially grateful to be included in this group. 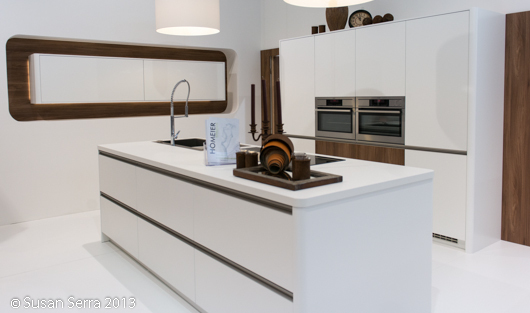 I have paid increased attention to the world of interior design, apart from kitchen design, in recent years having taken the time (and money) to travel to many design shows and events. 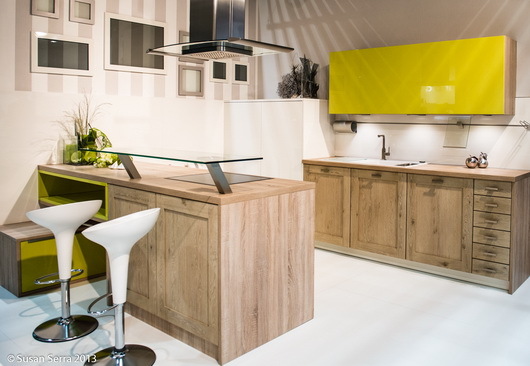 As the kitchen is ever more connected to surrounding rooms and products and materials from surrounding rooms are finding their way into the kitchen, it is very important to be an astute observer of what's happening in interior design today. 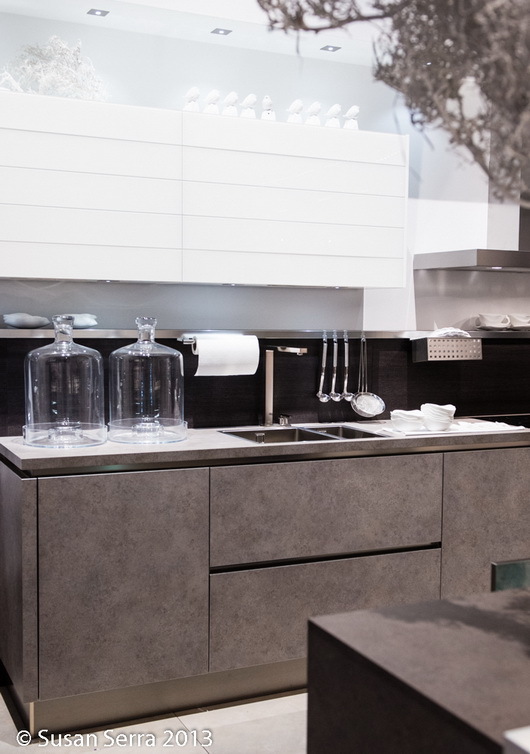 I will look for products, materials and design concepts which can be brought into the kitchen in a seamless way to create the "flow" that connected well designed spaces have. I just cannot WAIT to take it all in! Here is some great information about Blog Tour 2011 and its fearless leader, Veronika Miller. Oh, and Veronika? She goes to an ENORMOUS number of design shows throughout the year. She may be one of the most knowledgeable people on interior design products and materials there is and that is no exaggeration. Events in London just on one day!1. Veronika, how and why was this idea born, to bring US design bloggers to the UK to find design inspiration? Blog Tour was born, as are many good ideas, over a drink and some scribbles on a paper napkin. We had just created a very successful gathering for bloggers at Arch Digest Show in NYC in March at which bloggers kept telling me that Modenus should host blogger events more often. People see us as a hub for interior design resources so it was a natural next step to create something that would boost design bloggers' visibility whilst helping Modenus report from trade shows and design exhibits with content from select groups of bloggers. It was a spontaneous moment between Troy Hanson at MMPI and Modenus which resulted in such a fun and inspired concept, something with a distinctly international tinge reflecting Modenus as a platform that is based in the US and the UK. So, over a few dirty Martinis in Hell's Kitchen NYC, BlogTour was born. 2. What are your professional goals for this trip; what does success look like? Bloggers have an opportunity to immerse themselves in design inspiration, meet international designers, journalists and peers and flex their social media muscle to show just how much buzz they can create for an event or a brand. I think it's important to show that design bloggers can be very influential and professional contributors to digital media. Many of them should absolutely be considered as media partners for larger brands or design related initiatives. Modenus was launched, and has grown, exclusively through social and digital media. BlogTour is a natural extension of Modenus and, as well as everything else, has further increased the visibility and reputation of Modenus in the US, UK and around the globe. 3. 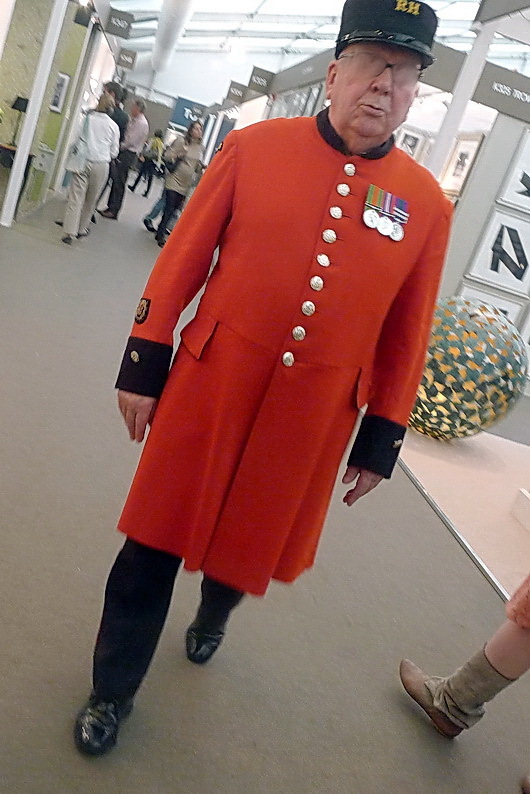 The agenda is so well rounded outside of the Decorex event. How do you hope these other opportunities for design exploration will inspire design bloggers? London Design Festival is unique in that it offers 9 days of design events which are anchored by big trade shows like 100% Design, Tent London and just after LDF, Decorex. We've covered London Design Festival for several years now and know how inspiring British design can be and how important it is to focus not only on the larger brands but on the hundreds of creative artisans and artists who exhibit independently or at smaller venues or even through pop-up shops. 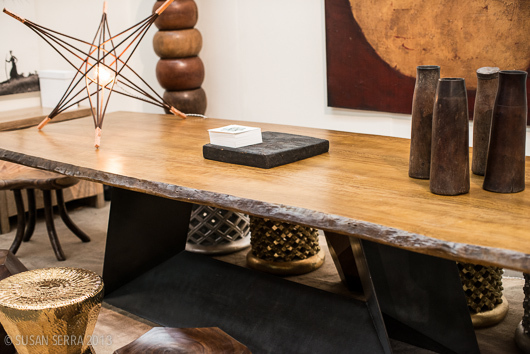 Designs can be over the top and provocative and other times just beautiful and inspired but the point is that that, in my eyes, it is in those smaller shops and venues that great design trends are born. I think bloggers will take away a lot of inspiration for future blog posts or design work and hopefully benefit from the great personal relationships they'll be able to forge while in London. 4. I know that I, as a design blogger, welcome opportunities to get up close and personal with manufacturers' products any way that I can. It's always a learning experience. I'm curious - what are the BlogTour sponsors' expectations and plans to interact with the design bloggers in an effort to showcase new design or technology in their products? We are thrilled and honoured every time a sponsor steps up to join BlogTour in London or any of the tours scheduled for 2012 because it is such a new concept but we realize they are seeing the same potential we're seeing. Some of the sponsors will indeed be meeting us at their showrooms or at a dinner venue in order to spend some time up close and personal with our American bloggers as well as some of the UK bloggers, while others appear to be quite happy to allow BlogTour to promote their brands through Twitter and other social media outlets to help them grow their own social media following. Modenus has always worked with every vendor on a customized basis to meet their marketing and budget needs and BlogTour is no different...we listen and come up with a solution that will give them the type of exposure they seek. Where else could this be but Vegas?KBIS is always a carnival of great product discoveries to be found, and this year, although much smaller, it was no exception. 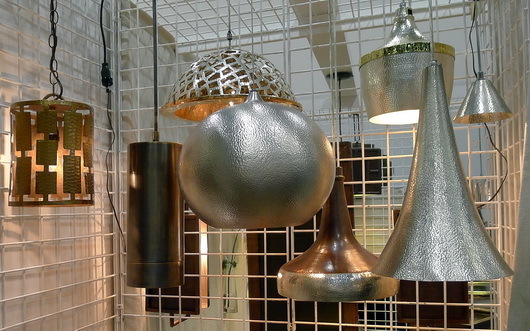 The exhibitors had their best game on to present products that are beautiful, highly functional, and classic winners. 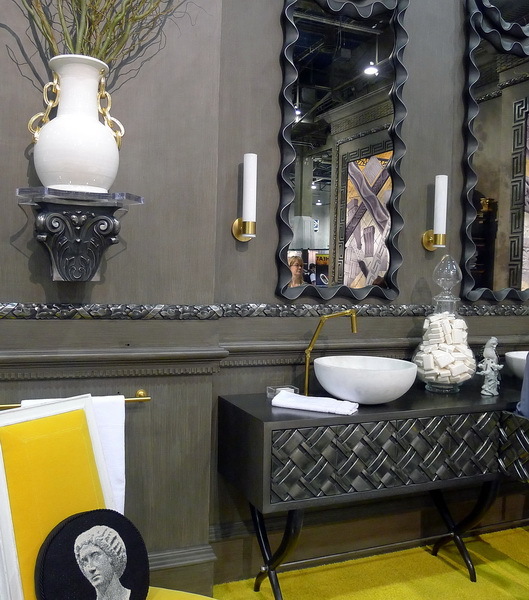 I took 800+ pictures (I'm a little obsessive when I go to a design show) so the ones I show in this collection are those that truly spoke to me and which I feel are worthy to share. 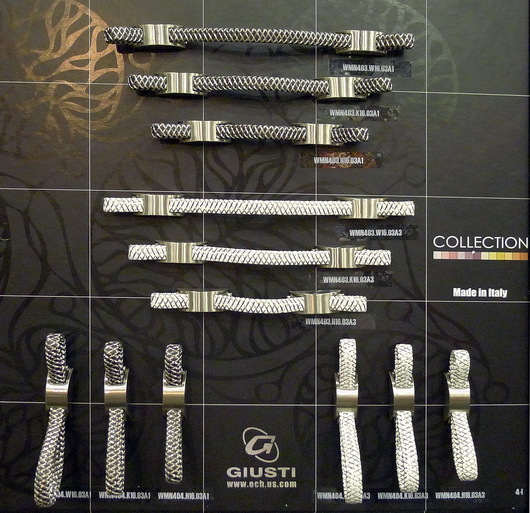 Also, take a look at the products that I will be entering in an ongoing basis in our New Products section. 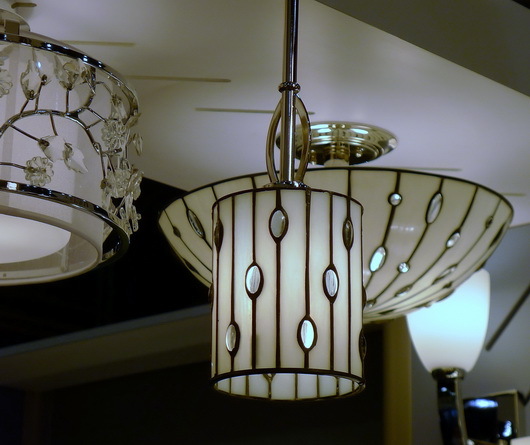 You may also find some connections to my previous post on KBIS trends. Enjoy the eye candy!! 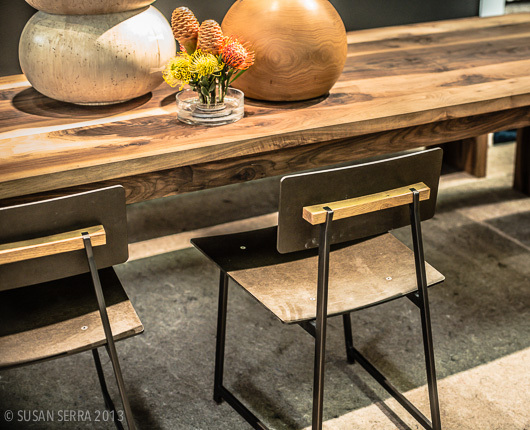 And don't miss my post in the fabulous blog, Design Milk! 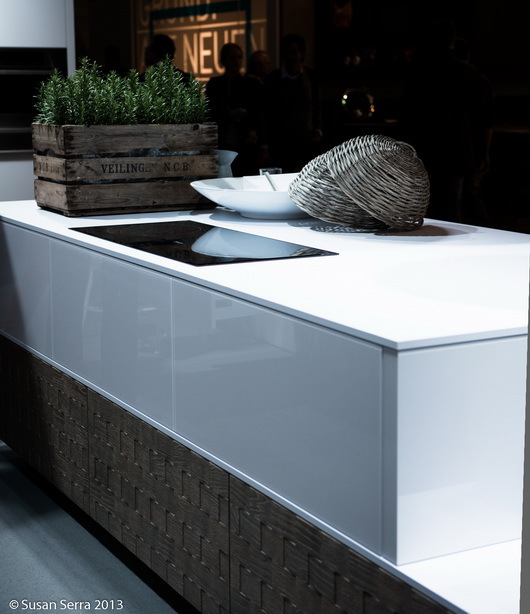 Merrilat KitchenFresh from walking the show floor of KBIS (Kitchen Bath Industry Show) held in Las Vegas, following is an overview of my impressions of what's new, what's trending and why. 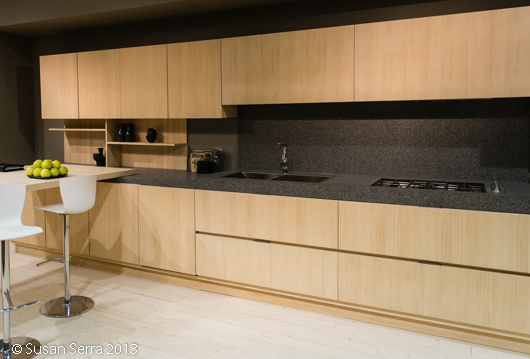 The kitchen and bath show (KBIS) was smaller than last year, three years after the financial crisis, which was quite surprising to me and to other veteran industry attendees I spoke to. Those who attended their first, second, or even third KBIS, have no concept of how different a show KBIS has become since before 2009 (I've gone for about 20 years now.) To see the show even smaller this year, and the booths stretched out (wider aisles, etc.) within the exhibit hall to achieve a perceived "fit", was obvious and a bit disconcerting, 3 years after 2008. Exhibit booths for major brands were drastically smaller, in probably all cases, often with little adornment (thank you Formica for a smallish but fabulously designed booth.) And, countless major national brands simply disappeared from the show floor this year. KBIS is a shadow of the show it used to be. The show program (a sort of soft cover book of conference schedules and exhibitor list) tells the story too -geez, was it small!! That said, I would never not go. It (the basis of the show) is my world, the one I reside in every day. How can I not go? So, I go, and I'm still genuinely very excited to attend every year. Good for those companies who did display...I assume due to the show's size, they had quality visitors to their booths. Without further ado, here are the major trend messages observed from the show floor! Visual examples will be forthcoming in future posts. 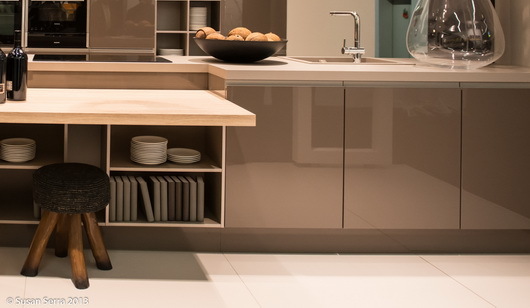 It's all about BROWN undertones - the whole spectrum from light, mid tones to coffee - brown finishes and often gray browns (more brown than gray) dominate cabinetry, new countertop introductions, tile, more. 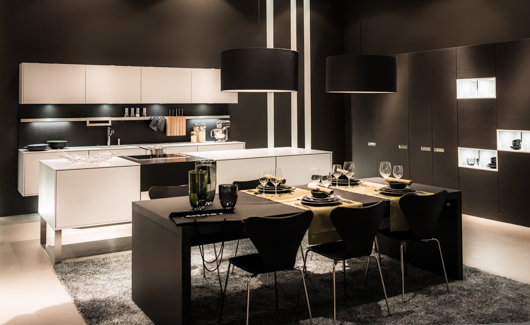 Black, at least in cabinetry, and white (as always), are in the mix....black as the new (yet classic) neutral for cabinetry? Budget - Many manufacturers introduced a lower priced line or moved/modified existing products into a lower price point to provide expanded choices to their customers. 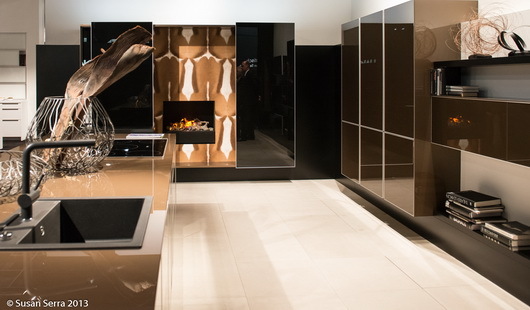 Even luxury brands such as Artistic Tile, Corian, Dacor and others have discovered and introduced new ways to make their products affordable. 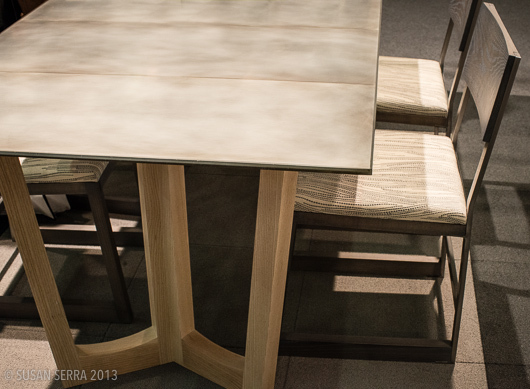 This is an across the board trend and seen in product design with a focus on style, durability and longevity. Lighting innovations continue to focus on led and substitutes were shown for the typical incandescent light bulb design but with energy efficiency built in. Task and accent lighting keeps getting smaller and more flexible in terms of installation and design (lighted tile in a backsplash anyone?) even color of lighting available. 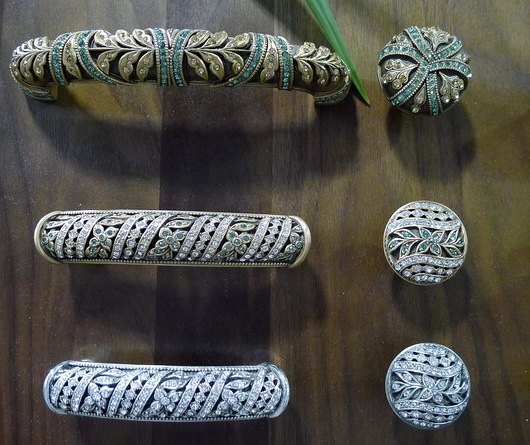 Cabinet hardware is focusing on additional warm finishes and styles with more visual weight to make a statement (bang for the buck theory and a good one). More soft modern styles and styles which are very modern, projecting significantly off the cabinet for its own statement, are trending. 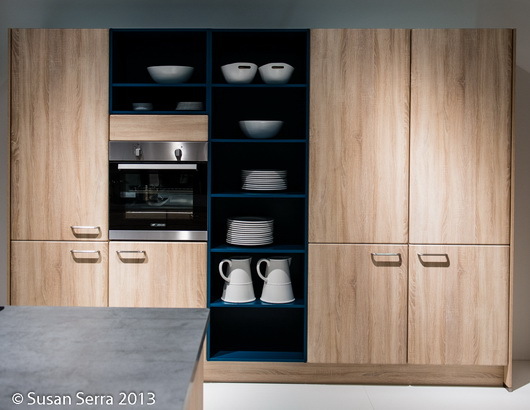 I also observed this in Germany in January at IMM Cologne. Color - I did see quite a few products of neutral shades which had a soft green undertone, sort of a gray green. Otherwise, color, in its bold form, was hard to find! I observed it in pockets, certainly not as a dominant theme at the show. Innovation? Not so terribly much this year as compared to other years. More repositioning/tightening of existing product lines and thinking more creatively in terms of budget products...which of course, is good news to many, many Americans, making the kitchen design process fun again for lower budgets. This is my preliminary (but well thought through) report. After looking more closely at my 800 images, I may add additional thoughts. More to come!! 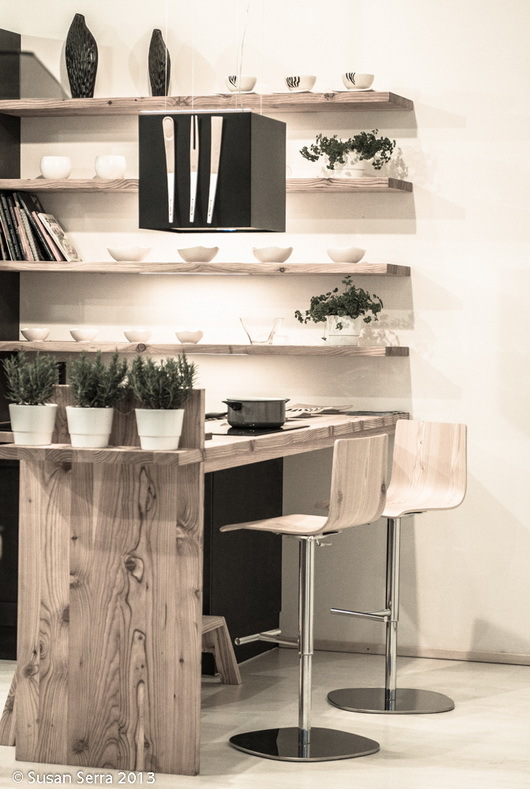 I am writing this on the plane on my way back from IMM Cologne, the Living Kitchen trade fair in Cologne, Germany. I was a guest of Blanco, as were four other bloggers (Paul_Anater, Jamie Goldberg, Cheryl Clenendon and Leslie Clagett) who are also part of the Blanco Design Council. It was an AMAZING trip. 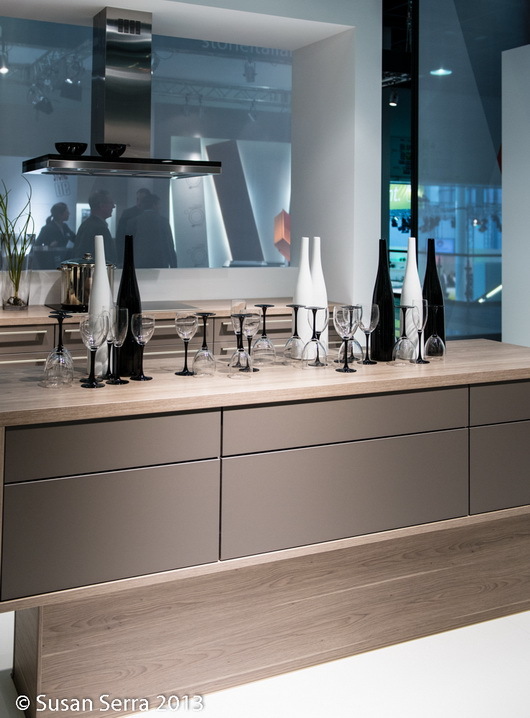 Germany is rich, culturally, and visually beautiful, not to mention on top of its game, showcasing innovative kitchen design and that includes Blanco's line of products which were exactly on the mark for today's (interestingly, US) consumer. So, I think the best approach might be to present my discoveries, impressions, and information in an organized way. I have just spent the last five hours of this flight sorting into categories, one by one, just around 2,360 images, taken over several partial days. THAT is a record for me! My singular goal at any show is to size up products and displays quickly (for the most part) and be ready to shoot fast, really fast, even as I see people walking into the image I want to shoot. In a nano second, I know that a section of an image can easily be cropped, so there is no dilly dallying, camera in hand. As a result, speed and quick right brain visualizing gets me lots (and lots) of good information in my images. It's an obstacle course, and I love it!! That said, I'm trying to do several things at once at the show...understand the products, the details, and the design, ask questions of those working at the booth...and move on! A veteran of 20 years of trade shows has made my particular process into a science! Now that the images are categorized, I think (unless I change something later) I will do an in depth series on the following topics. 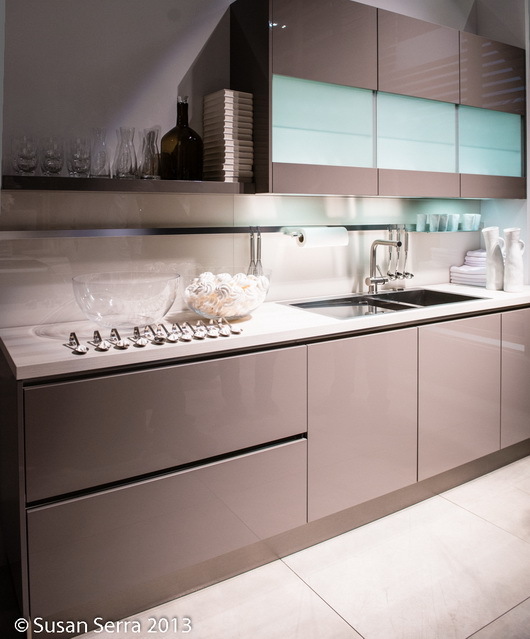 Oh yes, and I really want to include a post on kitchens on a budget, as I have been inspired by some of the displays I've seen - let's just say, high design/low budget is SO doable and you've got to see how easy it is to achieve a fantastic modern kitchen. If anything else comes to mind, I will adjust the agenda. What about you - what information are you interested in knowing?? 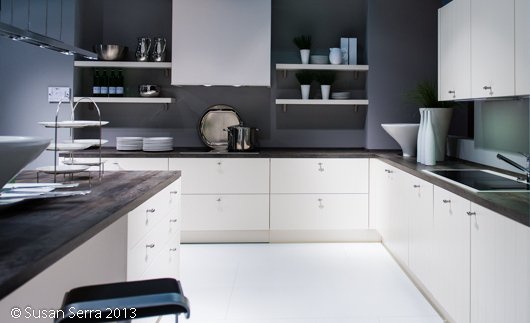 Is a Kitchen Design Trend Always A Trend? "I am buying a new house. I am planning to have the kitchen counter in white and cabinets in dark brown, but I am afraid the trend will go out of style. what do you think? 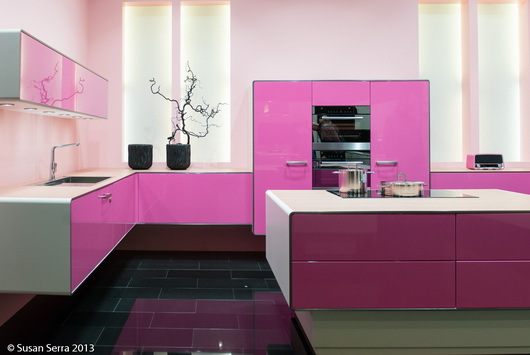 what is the most classic color for the kitchen?" What strikes me is that you are calling it a trend. 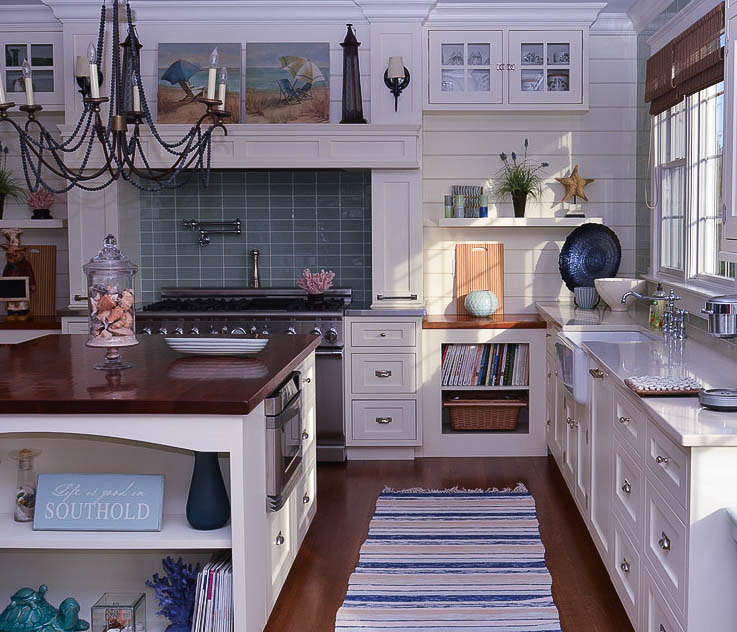 I don't see white countertops and dark brown cabinetry as a trend, at least not a strong trend, possibly a mini trend. But, more importantly, I feel this combination of colors can be considered classic. The finishes you are talking about are neutrals, even the dark brown. 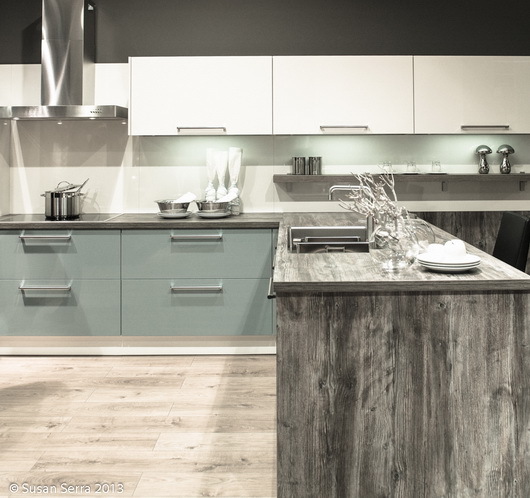 It is a natural finish for cabinetry, and if the rest of the kitchen is designed and decorated in a classic way, as opposed to integrating all the latest design ideas from magazines, catalogs and web home design sites, then you're safe. You needn't worry about your kitchen being pigeon-holed as a trend. As far as what is the most classic color, of course, white is classic. Most brown wood stains in the medium to dark tones are classic, and some medium to light tones in wood stains. Remember the pickled maple light stains in the 80s and 90s? They were a strong trend, very strong. But, I see that having been a trend partially because those pickled maple/oak colors were an unnatural color for the wood. If these are the colors you like, take note of the above advice, and I'd say, go for it! 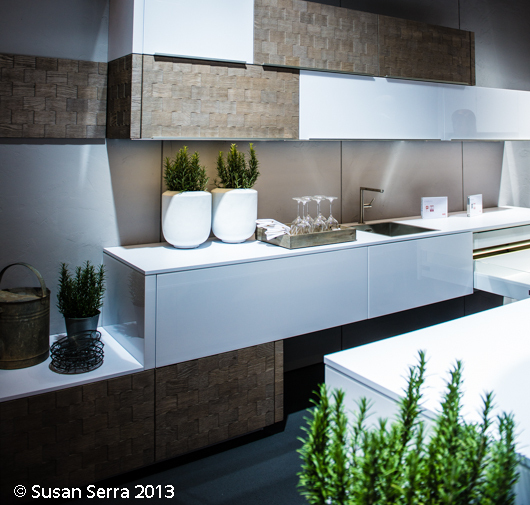 Oh, it occurred to me that I took images of all these kitchens at KBIS to show you! 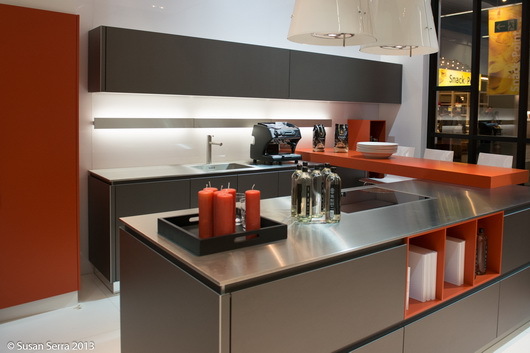 I think you will see a good deal of modern design as well as dark, rich, browns. You'll also see a common thread of lights, such as creams, and browns, combined. I thought that was interesting. 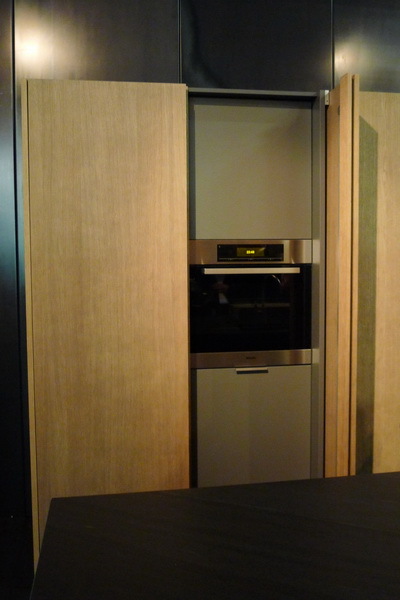 I did not see the same amount of black cabinetry that I did last year, although it is still seen. I was able to get some very good shots without people in them, and, short of a few shots that are, well, cockeyed, my new camera did an excellent job! 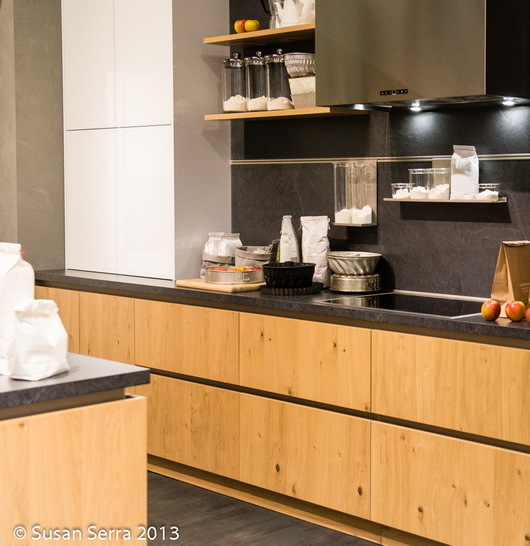 The Idea Center kitchens by Meredith, will be up soon. Enjoy it! And, Happy Mother's Day! I touched on a few things in my glam.com post, but, before I show you more products, I want to talk a little more deeply about the trends I saw at the show. Here's what I observed...and I walked the show with a heightened awareness to just observe, put together puzzle pieces, listen, compare, look, and learn. I won't single out products here, I'll just give you my impressions. Look for examples as I show you specific products soon. 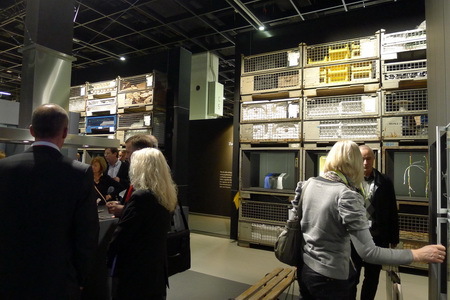 ECO-themed issues, displays, products or any combination thereof, collectively, WAS the 80,000 ton gorilla at the show. It's everywhere. It's shouted from the rooftops (I wish I had taken a shot of Sears' booth). It's the biggest marketing message of all. It's seen in the displays, in press releases, and is on all the KBIS attendees minds and in their words (at least everyone I spoke to.) 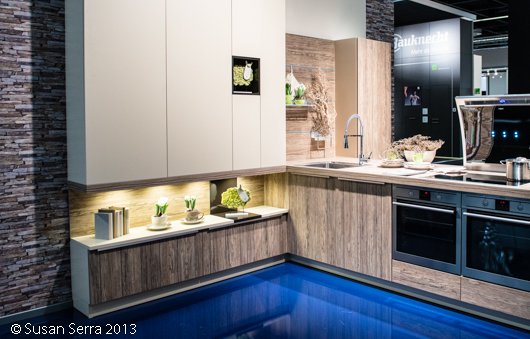 I took a 1/2 day seminar on green kitchen design, so I guess it's something I'm attuned to as well. Most companies "get it" and are on board the green train, wherever it's taking us. I mean, what can be bad? However, that said, beyond the message, in reality, it DOES look like many companies are making special efforts to embrace new technologies to make their products more energy efficient. I've seen more leds than ever as substitute lighting in various (mainstream) products compared to previously used, less efficient, lighting. 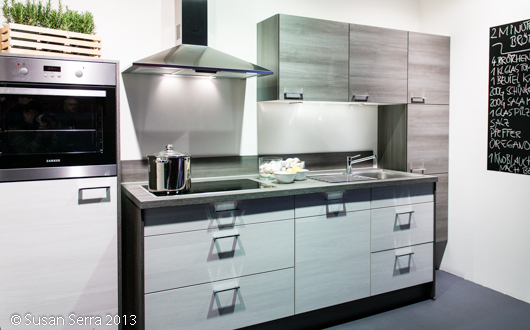 Appliance companies are actively promoting increasing energy efficiency. Gas cooktops are more energy efficient. An energy efficient hood, which I do believe is the first one to be energy star rated. An effort for faucets to deliver less water out of the spout, but not sacrificing pressure. The mainstream companies are responding bigtime. I cannot predict our economic future, but I can tell you that glamour in the kitchen is very much alive and well! Maybe, it's like having one last dance on the Titanic, who knows, but, wow, baby, many products for the kitchen are ALL DRESSED UP! To me, it's an edgier, riskier point of view that these mainstream (and smaller) companies feel comfortable "going for." Good for them. It's about time! Shine, shimmer, glass, leds, some color (not a whole lot) and you've made a statement. BROWN, BRONZE, AMBER, WARMTH, ETC. ETC. 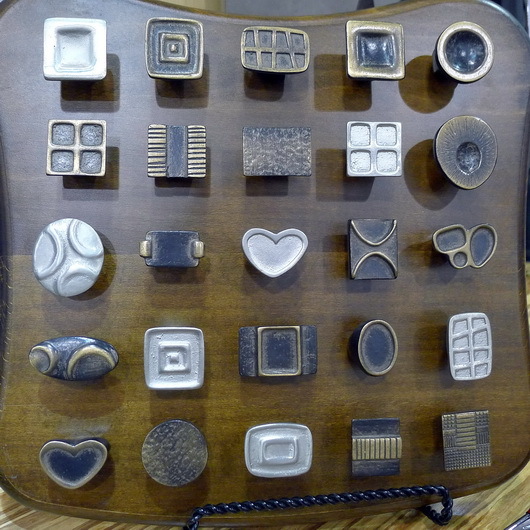 SO much at the show was brown...and various shades of browns, and different browns together in whatever materials amuse. 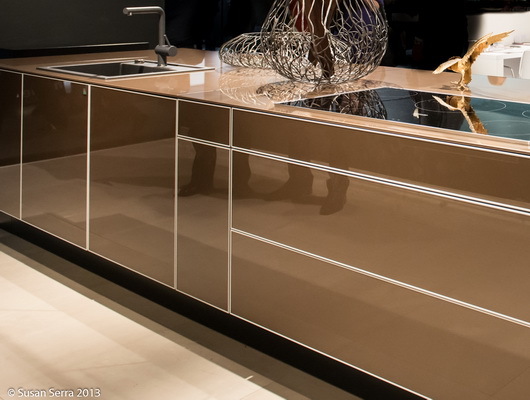 Brown metals abound still, in hardware, hoods, sinks, faucets...Brown was really the king at the show. 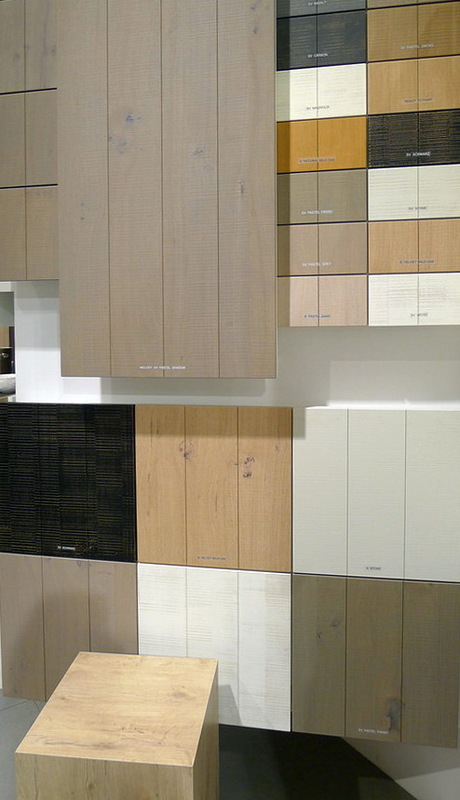 Deep, rich, stains in wood cabinetry were absolutely the norm in most displays I observed. And, I'll tell you this...if it wasn't deep, rich browns, it was browns with white accents. As mentioned a bit above, technology is doing amazing things in products. 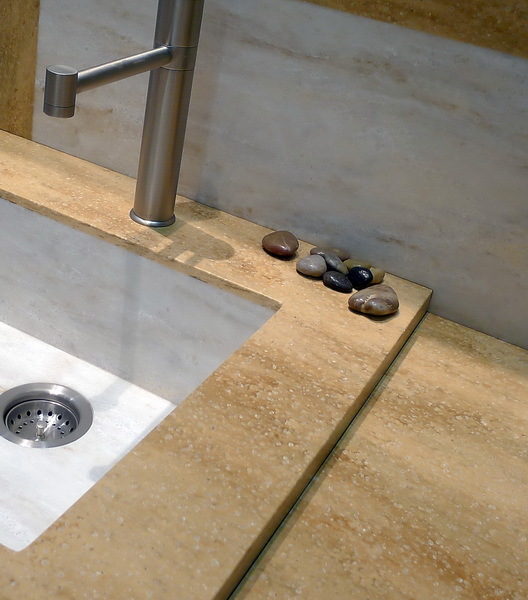 It is creating beautiful patterns in tile, it is creating beautiful solid surface patterns. 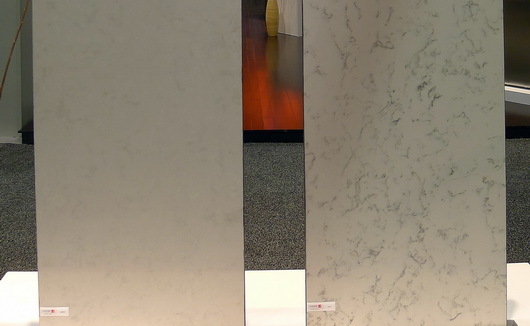 Yes, solid surface, thanks to fresh, new, patterns, probably as a result of enhanced technology, need to be looked at again. 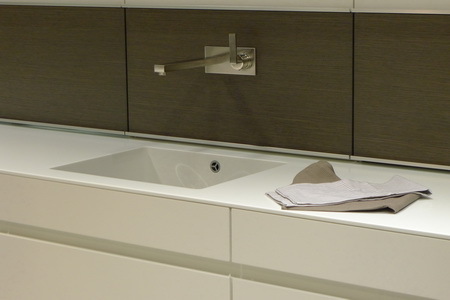 And, yes, I do mean Corian. 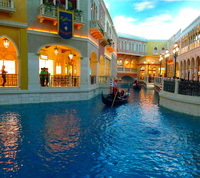 It was gorgeous in some displays. But, more than that, technology is giving us so many choices in how we use our appliances to get what we WANT out of them. 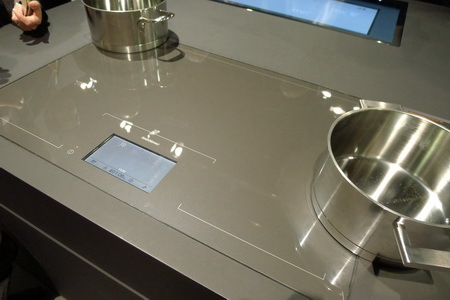 Technology is helping to give us time back in our lives, it's organizing one's life in the kitchen. I see more technological leaps this year than ever. 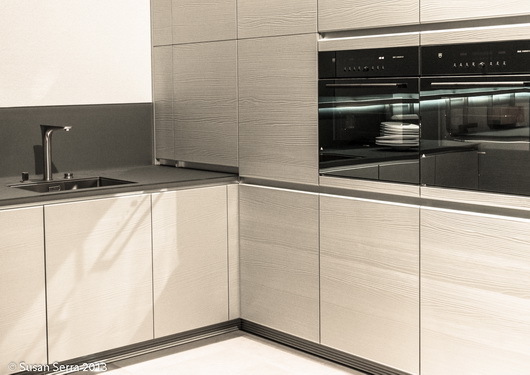 Appliance companies are stepping up to provide us with even better looking appliances. 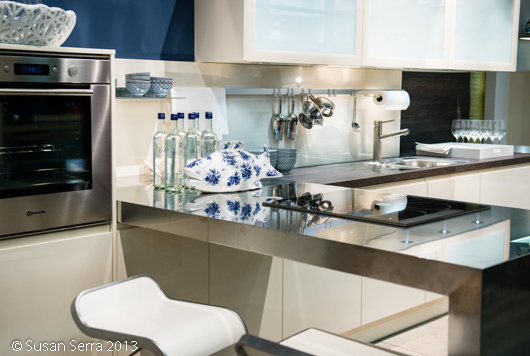 Also, appliances that cook or chill in far healthier ways than ever before. In more sizes and configurations than ever, and the continued introduction of smaller, niche, products to answer those quirky needs and desires of consumers. There are just more choices, let me say it like that! 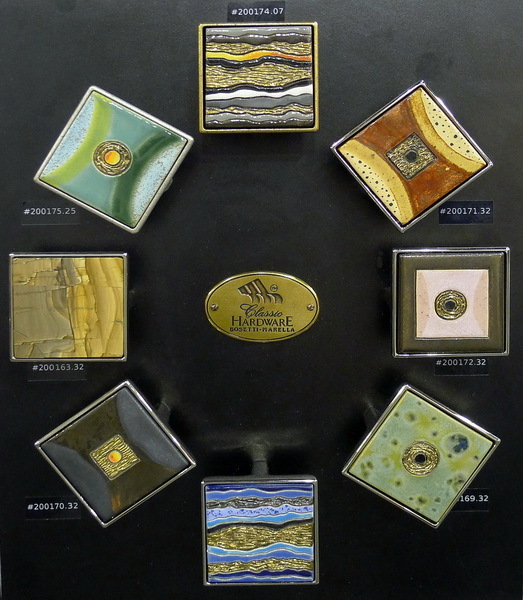 The artisan touch was huge, in tile, big bold, patterns in hand crafted tile. 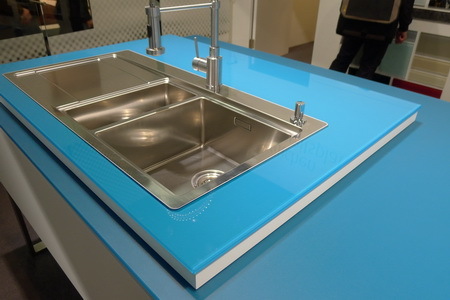 Artists designed sinks, even in mainstream companies, hoods, interesting countertops, and more. The combination of matte and shine, texture and smooth, coexist and create a more personal expression. 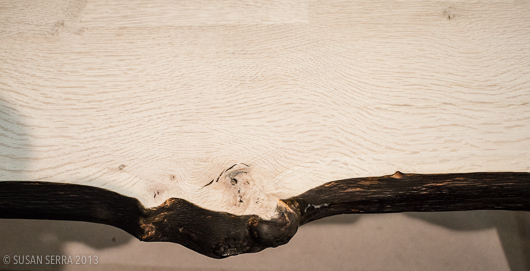 Natural materials...everywhere. If not real, then the look of nature. 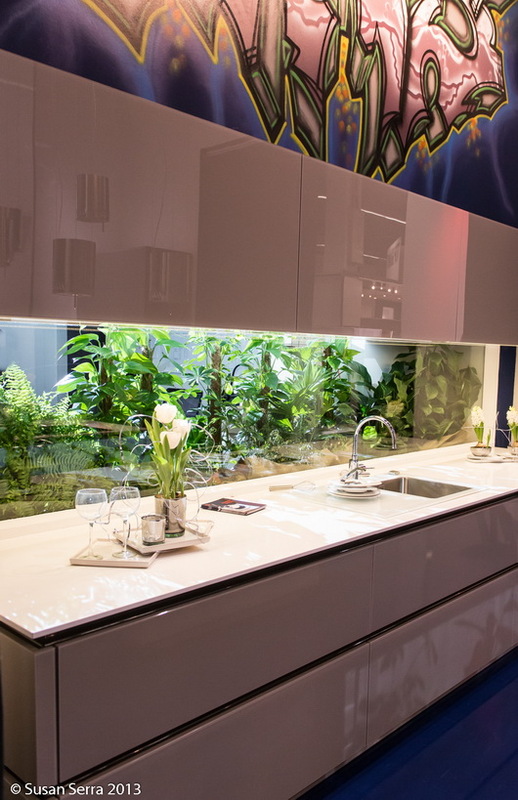 In cabinetry, countertops, hardware, sinks, and more...Mother Nature is surely the Queen this year!